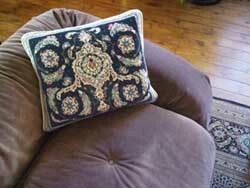 The Tabriz Cushion Design finished the 'look' I wanted for my living room! 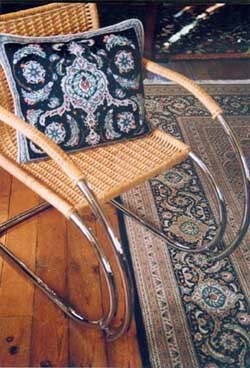 The Tabriz needlepoint tapestry that I had created for my classic piano bench was a huge success. But what more could I do to integrate it into the rest of our contemporary living room? Why not add the same pattern somewhere else in the room! So I created a cushion design for our modern Italian suede sofa which is at the opposite end of the room. 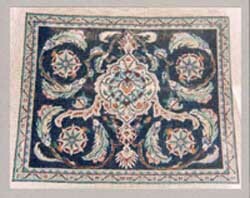 First, I reworked the various design elements from my Herati carpet border. To stay true to the original design, particularly the very geometric border, I hand-painted the needlepoint canvas grid very meticulously. The hand-painting is complete (above) and ready to stitch! 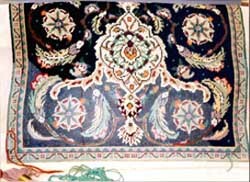 You can see from this photo, how simple and straight forward the stitching is when you follow the painted design. It’s very exciting when it starts to take life! I’m particularly pleased with the curvaceous flow of the palm leaves and rosettes around the central medallion. The soft colours of mauve, turquoise and sage green against a dark navy blue background are stunning! 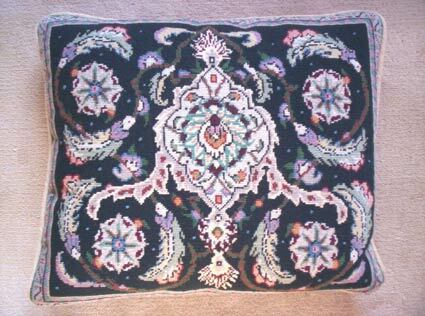 The intricate cushion design integrates the pattern on border of the Persian carpet with the modern furnishings! Together with the Tabriz Piano bench, they have elegantly created the finishing touch to my living room!